Charles Edward Anderson Berry (October 18, 1926 – March 18, 2017) was an American singer, songwriter, musician, and one of the pioneers of rock and roll music. 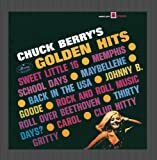 With songs such as "Maybellene" (1955), "Roll Over Beethoven" (1956), "Rock and Roll Music" (1957) and "Johnny B. Goode" (1958), Berry refined and developed rhythm and blues into the major elements that made rock and roll distinctive. Writing lyrics that focused on teen life and consumerism, and developing a music style that included guitar solos and showmanship, Berry was a major influence on subsequent rock music. Born into a middle-class African-American family in St. Louis, Missouri, Berry had an interest in music from an early age and gave his first public performance at Sumner High School. While still a high school student he was convicted of armed robbery and was sent to a reformatory, where he was held from 1944 to 1947. After his release, Berry settled into married life and worked at an automobile assembly plant. By early 1953, influenced by the guitar riffs and showmanship techniques of the blues musician T-Bone Walker, Berry began performing with the Johnnie Johnson Trio. His break came when he traveled to Chicago in May 1955 and met Muddy Waters, who suggested he contact Leonard Chess, of Chess Records. With Chess, he recorded "Maybellene"—Berry's adaptation of the country song "Ida Red"—which sold over a million copies, reaching number one on Billboard magazine's rhythm and blues chart. By the end of the 1950s, Berry was an established star, with several hit records and film appearances and a lucrative touring career. He had also established his own St. Louis nightclub, Berry's Club Bandstand. But in January 1962, he was sentenced to three years in prison for offenses under the Mann Act—he had transported a 14-year-old girl across state lines. After his release in 1963, Berry had several more hits, including "No Particular Place to Go", "You Never Can Tell", and "Nadine". But these did not achieve the same success, or lasting impact, of his 1950s songs, and by the 1970s he was more in demand as a nostalgic performer, playing his past hits with local backup bands of variable quality. His insistence on being paid in cash led in 1979 to a four-month jail sentence and community service, for tax evasion.